The second song on the album, VERSES OF GRACE, gave the CD its title. The chorus: 'Joined together, we meet and go on, Gathering light - and it may be the dawn' is the essence of ‘Another Dawn.’ The song was written in honor of the 2009 inauguration – and the last time a crowd that size gathered together in the spirit of hope was Aug 1969 at Woodstock. At that moment, we felt a rebirth of the same values: it was time to look after each other and look after the planet. The whole collective conscience of the country seemed to be shifting then, you could see it happening, and it was a reason to celebrate. This was a moment in time when you could really feel change – could feel good things happening in the world. I’ve always felt that folk music tells the story of the people, and of the human condition. THE NEW SQUIRE Medley of: The New Squire / Hiking in the High Country / Ruby as a Child. Instrumental medleys have an important place in our repertoire. The traditionally short tunes were originally written in a specific format to fit the steps of a dance. We enjoy writing new tunes in this old tradition, and by stringing them together into a medley we give the piece an opening, a middle and an ending. The New Squire was written by our guitarist James in honor of his newborn baby boy, Dorian. GREAT DEPARTURE was written after my father’s passing last year. It’s not meant as a somber song, but to reflect on the nature of change. The lines: 'The tender morning hesitates; Emerging from a dawn; And in the pure light of the sun; The darkness soon is gone' talks about death as a transition, rather than the end. It became obvious to me, when my dad died, that the ‘First World’ loves to celebrate birth but is not so evolved in dealing with death. My feeling is that we ought to celebrate birth and death as a continuation of each other, that cycle is what life is all about. NEVER TIRE OF THE ROAD is a traveling song, that Andy Irvine wrote about Woody Guthrie. I was not directly influenced by Woody, but by the next generation, who were – artists like Bob Dylan and Andy Irvine, an Irish musician who grew up in Dublin trying to do an Oklahoma accent. I embraced the spirit of Woody; busking and traveling, where you learned to survive on your own terms playing music in pubs and on street corners. That was my real life education, bumming around playing music and moving from place to place. I went out with a buddy of mine in our mid teens, playing in the streets of Copenhagen then moving on to the British Isles and Ireland – sleeping in barns and hitchhiking around all summer. When unforgiving winter hit Norway, I moved on to the warm hospitality of Greece, and eventually made it to the States when I was 21. There is something romantic and somewhat wonderful about a lifestyle following in the footsteps of the rambling hobo of the past. I can say this as someone who lived and struggled with it – you forget the times you went hungry, living rough, sleeping in parks and getting arrested. But you always remember the joy of traveling around playing music and getting your education in the school of life. That way of living is a big part of who I am and I’ll always have a soft spot for it. Woody Guthrie managed to influence not only the working class, but also the entire country with the passionate spirit that drove him around. He was a bit of a rogue and a romantic figure. JOMFRU is one of the oldest songs in the Norwegian Ballad tradition. It tells the true story of a maiden (jomfru) stolen away from her own wedding in March of 1288. It was a time when every village in every county had their own king. This particular maiden is stolen away before she’s wed to the king of another village – this is an historical recounting of an actual event – the type of thing that was part of everyday life at that time. 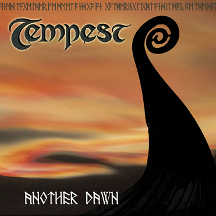 In the mid- ‘80s I recorded an acoustic album of Norwegian folk songs – and I still wanted to do a Norwegian album in more of a rock and roll style, so I try to sneak one of those songs onto each of the Tempest albums. I loved these songs growing up and still love them, today. They’ve always featured in our live repertoire, and they fit quite well into the Celtic genre both musically and geographically. DAGDA'S HARP (Dagda's Harp / Chief O'Neill's Favorite / Poll Ha' Penny) The first part of Dagda's Harp is a nice free-flowing guitar piece, that showcases James' fine acoustic work. We wanted to incorporate more of the personality of the band into the record, so Damian plays some percussion on it as well. It is a refreshing break-away from the big, rich, electric sound of the rest of the album. THE MOVING-ON SONG was written by Ewan MacColl for a Radio Ballad called 'The Traveling People'. This radio documentary was made for the BBC in the 1950's about the Tinkers – the modern day gypsies of the time. They lived life on the road moving from town to town and generally having a rough time settling down, since no one wanted them around. BLACK JACK DAVY is our adaptation of a Celtic Folk Ballad, possibly written about 1720. The song has many variations such as The Gypsy Laddie, Raggle Taggle Gypsy, Gypsy Davy etc., and has often been used and recorded not only in Ireland and The British Isles, but also in Canada and The United States. Tempest originally recorded this song in 1988 on our very first demo-tape. In 2008, we got the original line-up together and performed it for our 20th anniversary at Karfluki Fest. A rousing live favorite, it tells the story of a wild, traveling gypsy who steals away the hearts of the womenfolk. HIGH RISE (High Rise / Fiddler's Lock / Kelly the Rake) We crank the energy level up to the highest decibel before wrapping up the record with a couple of original pieces written by band members and a spicy little traditional tune. All of these songs deserve to be here, and I am proud of what the band has done on this album. Our producer, Robert Berry, did a heckuva a job pushing us further than we realized we could go. We’ve worked with Robert since recording 'Turn Of The Wheel' in 1995, and he and the band were ready and really excited to do another Tempest album. Together, we recorded an intense moment in time, and we hope you will enjoy it.